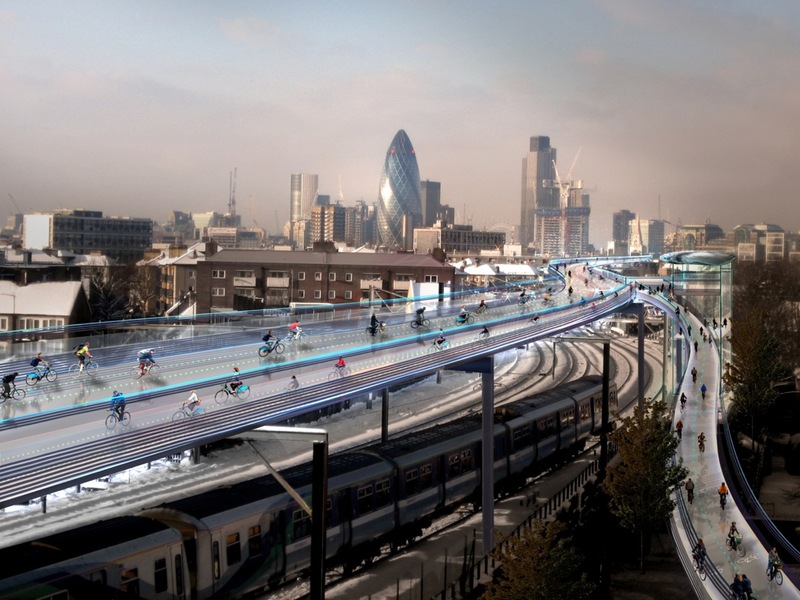 The bicycle highway: Plans unveiled for £220m ‘Skycycle’: We look at what this means for London’s scooter riders. Anyone who’s ever been packed like a sardine in a tube carriage which has broken down at rush hour during one of the hottest summers on record will understand why scooters have become such a popular way to get around London. If a revolutionary concept to build a network of pathways above the streets goes ahead, travelling around the city could get even better. At the end of last year, plans to build a 135-mile ‘SkyCycle’ to serve almost six million people were unveiled as a possible solution to congestion in the capital and as a way to reduce the number of road accidents. The three-storey high roads would be made up of 10 proposed routes, each of which could accommodate for 12,000 cyclists an hour, with the possibility that moped riders could be allowed to use them too. It goes without saying that motorcyclists are far more vulnerable than car drivers, and even in a collision at just 30 miles per hour, a great deal of harm can be caused to a rider, whereas relatively little damage is usually done to the car. By separating scooters from careless drivers who don’t check their mirrors, the staggering 3,000 moped rider casualties that happen every year in the UK could be greatly reduced. Thanks to their smaller, less powerful engines, scooters aren’t able to reach the dangerous speeds that other vehicles do and Honda scooters like the NSC50R are ideal for getting around the city, especially as they are so economical. In fact, the five best-selling bikes in the country are all under 125cc and in 2012, the Motorcycle Industry Association reported an 8.5% rise in registrations for small bikes. As well as being cheap to buy, they’re also incredibly cheap to run. To put it into perspective, the Honda NSC50R will do more than 30 miles on just one litre of fuel and various other scooters are able to do more than 100 miles on £5 worth of petrol. Moped riders also have the added bonus of free parking, as well as not having to pay congestion charges. With the price of fuel going up all the time and the cost of public transport rising faster than inflation, the popularity of the moped is inevitable. Home to more than 160,000 motorcycle riders, London is said to be the scooter capital of the UK and although mopeds now have permanent access to red route bus lanes, with their popularity rapidly increasing, an alternative solution to congestion needs to be found. Safety should always be the first priority though, and despite the fact that in recent years, the number of motorcycle accidents has declined, Transport for London do recognise that they still have a long way to go to improve road safety. It could be that the SkyCycle is the answer they’re looking for.